Baby Brogue In White, Unisex soft leather baby shoes Baby Brogue in white classic Brogue design punched and sculpted toe cap and sculpted collar. Ballerina Baby Pink. Girls soft leather ballerina baby shoes in baby pink, low toe ballet style shoes with silk rosebud and satin laces. Ballerina Heart In Red Glitter, Girls soft leather baby shoes, Ballerina style shoe with a heart with red glitter design. Baby Brogue In White And Navy, Unisex starchild soft leather baby shoes, Baby Brogue in white and navy. Classic two tone brogue style punched toe cap in navy on white shoes. 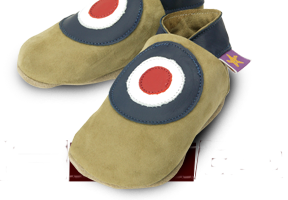 Plain Navy, Boys starchild soft leather baby shoes, Plain shoes in navy.